Despite the rise in online shopping over the past few years, it seems that most consumers still prefer to shop in-store. There is no doubt that mobile and PC spending has dramatically increased, however a recent survey which questioned over 2,000 people found that 41% of UK shoppers preferred visiting shops to online shopping, and a significant number do their research online before buying a product in-store. 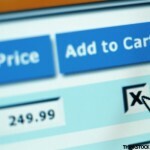 44% get annoyed about the delivery charges added to their online checkout. 11% have used their mobiles for discounts and special offers to use in store. Alan Gabbay, founder of Udozi, said: "In today’s digital age, constantly connected consumers have come to expect access to their favourite brands and retailers when on the move. But even though a large chunk of online Brits now own internet enabled devices that they can make purchases from, mobile and online alone simply can’t compensate for the in-store shopping experience, as the majority of people still want to ‘try before they buy’ and speak to experts in-store. “What’s key is that retailers learn how to marry all these channels together, especially as mobile is clearly influencing consumer shopping behaviour as people are searching for items they want on the go. What do you make of this data? How will you use this information to increase your online sales?